Chocolate Treats in a Delightful Basket Arrangement with Gerberas, Lilies, Orchids For your Love ones Contents may vary. We can make this basket with a colour theme of your choice, please include preferences in the comments section when placing your order. 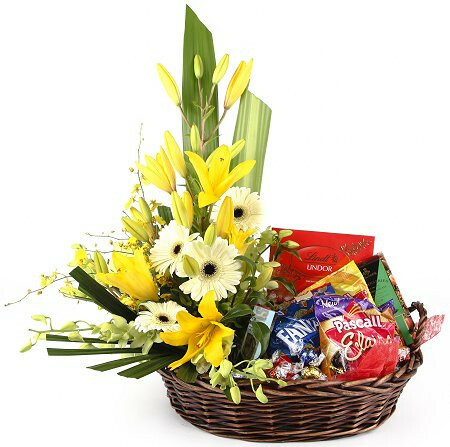 Chocolate Treats in a Delightful Basket Arrangement with Gerberas, Lilies, Orchids For your Love ones Contents may vary, We can make this basket with a colour theme of your choice, please include preferences in the comments section when placing your order.